Paul and I were talking and praying through some things this morning. He had a prayer sheet with a list of things to declare and start your day with – lots of I am statements that he copied from Al Mack’s timeline. Some of these statements got me thinking. We all have learned that praying the Word back is a great thing to do. Our words have power and when we declare these things out loud, things happen and heaven moves. Paul likes to say, “The Kingdom is voice-activated” and he’s right. Our words do activate the spirit realm around us. While going through the prayer points and declarations I kept thinking about how much every one of these requires faith and trust if we are to believe them. For example, how can I know I’m a new creation in Christ if I don’t have faith in that if I don’t trust that the Word is true? Even though I was praying along while Paul was reading these out loud, I kept having more and more thoughts along the lines of how much faith it took to really believe what I was saying. Was it true, did I really believe what I was saying and praying; or was this just a mantra of ritualistic words that I was familiar with? Did I really believe this in my entire being or was this simply head knowledge? After a few minutes we got to the statement, I am the righteousness of God in Jesus Christ (2 Cor 5:21) and my thoughts suddenly stopped. I realized that this was true – not just in my head but down in my very being, through and through. I believed it because I have faith in the other things He has said and it takes faith in every step and every statement to come to a place where I could emphatically state these things as truth. They weren’t empty statement or just words on a page. I began to repeat some of the “I am” statements with the knowledge, with the faith of the truth that they revealed. I am righteous because I am a doer of the word. I am holy because I’m a new creation in Christ. . . I was realizing, deep inside and not just in my head, that I am these things and whether I’m feeling it or not, I am complete in Him. I lack nothing and I am far from oppression. Fear is simply a lie that I cannot afford to entertain. Knowing this makes me able to walk in peace and joy no matter what the world throws at me. And, no matter what tragedies and difficulties that are around me I can remain in my identity and be of some use when needed. How in the world can I influence or help anyone if I don’t even know who I am? I can’t, at least not for the good. And who needs influence if it’s bad? No one! It comes down to identity. Reading these statements again this morning made me realize that I actually believe them all. My faith has grown and it encompasses all the vastness He says about who I am. A few years ago, that wasn’t the case. I used to read things like this all the time but, I only read them believing they were wonderful but not actually about me. Today the epiphany was, I am all of these things and the peace I can enter into and not have to ever leave is the fruit of that. Today the truth that has been in my heart finally reached my head! Understanding has arrived. I’ve been walking with the Lord 10 years now. Who knew He could be so good to me!? Paul got saved first and I’ve got to tell you, I was not happy about it. No, if fact I was pretty ticked off. I wanted to know who came and stole my husband away. What happened to my “cool” husband? He started acting really weird and quoting the Bible to Chelsea and me and frankly, it only made us both mad. Just who did he think he was anyway? He couldn’t judge us like that! HE was trying to share his new reality but it felt like condemnation to both of us. We didn’t appreciate the change in him at all. Did this happen to you; did you get saved before your spouse or them before you? It does not make for a happy marriage I’ll tell you that much. When Paul got saved, we were living on the grounds of an Episcopal church in a one-room cottage, as caretakers and grounds keepers. Much of our responsibility entailed installing many gardens and all things landscape. We were also members of the church and attended every time the doors were open. Due to this; I felt we were more holy than the Pope! I mean, how much more spiritual or holy can you get right? I would later learn that church attendance had nothing to do with how spiritual or holy you were, much later. I was also very much into the social aspect of the church because it gave me an opportunity to cook and entertain, which is my passion. This led to me befriending the new caterer who began using the church’s commercial kitchen. I thought I had died and gone to heaven! I had found my tribe. You see, I always joked around about writing a book entitled, A Day in the Life of a “Wannabe” Caterer; only eat the ugly ones. I lived for cooking and entertaining. As my friendship grew with this caterer, I began to help out and was able to share with her the many things I knew that would be useful in her business. I began helping with the flower arrangements, menu ideas, recipes and even working for free. Of course, I also worked full time during the week in our family business too. Every weekend, I would be up at the church lending a hand and have the time of my life. I did get paid for my work after a few months, though. We become great friends, doing everything together for many years. We took care of each other’s children, we did charity events together, and we partied and cooked together, vacationed together; we celebrated life the best way we knew how. And then Paul got saved. . .
That changed everything. He was seriously making me not want to be around him very much. He stopped hanging out with our friends and began going to meetings every chance he got. We were still members of the Episcopal Church but when not attending a meeting there, he would run off to meetings where he could be around other people like him who were experiencing God. When he’d return from these meetings, he wanted to share and talk about what he’d experienced, but I would have none of it; I didn’t want to feel condemned by his words. He really was only sharing the awesomeness of God, but I only felt condemnation. I began to find opportunities to be gone when he was home which often meant I was at my friend’s house, 35 miles away. I was already feeling somewhat rejected and not good enough anymore so I’m glad I didn’t know he wanted a new wife! Yes, even though I was mad at him and didn’t understand what was happening to us, I would have been devastated to know what he was feeling at the time. I only learned about this years later. God told Paul He wasn’t going to get him a new wife but instead, Paul would have to fall back in love with me. Paul needed to start making a place for me in his “new” life. This struggle continued for a couple more years. In the mean time, we left the Episcopal Church because they began ordaining gay Bishops and although we both had personal friends who were gay; neither felt it represented God at all. When we left the church, we also had to leave the cottage we’d been living in for years and that was sad. The good news was, we were getting our own place and that was a dream come true, finally. Paul had begun praying in the local healing rooms a year or so before and was now in leadership. He still kept running off to other meetings and conferences while I kept on catering, but now I was working with my brother. We were almost living separate lives, but God was still working on this thing! This is just an excerpt of the journey but needless to say, Paul did make a place for me. He prayed for me all the time, without me actually knowing about it except things began to feel different. He no longer fought with me or tried to correct anything I was doing. He literally just loved me where I was. And also, by falling back in love with me again, he made a way for me to enter into the kingdom. My offenses began to fall away. God started whispering to me there in that place and I even began to love my husband again. Prayer works as we know but it also takes honor and respect. When I began to receive that (and I absolutely did not deserve it! ), my heart changed. I felt a tangible place being made for me to come alongside my husband. I had no clue what it was, or what it meant. What I did know was that it felt good and it felt safe. I pray my story might encourage you to pray for your spouse and simply love them right where they are. We can change nothing on our own, but my Jesus certainly can. Persistent prayer along with respect and honor is a game changer and I know we all need change to happen. A day in the life. . . . Yesterday I had finally gotten the chance to get back out and do some much needed weeding in my back yard. After about an hour, Paul was able to come out and help too. We really made a lot of progress and the garden was beginning to re-emerge again. It was in such bad shape! I believe that every weed seed that landed on the ground took root. We’d already been out there a couple of hours or more taking back the land, so to speak when I decided I had done enough. I got up to go inside to use the restroom before picking up all the tools and piles of weeds. While in the restroom, I saw something moving on my shoulder out the corner of my eye. I reached around and grabbed whatever it was and felt a sting. 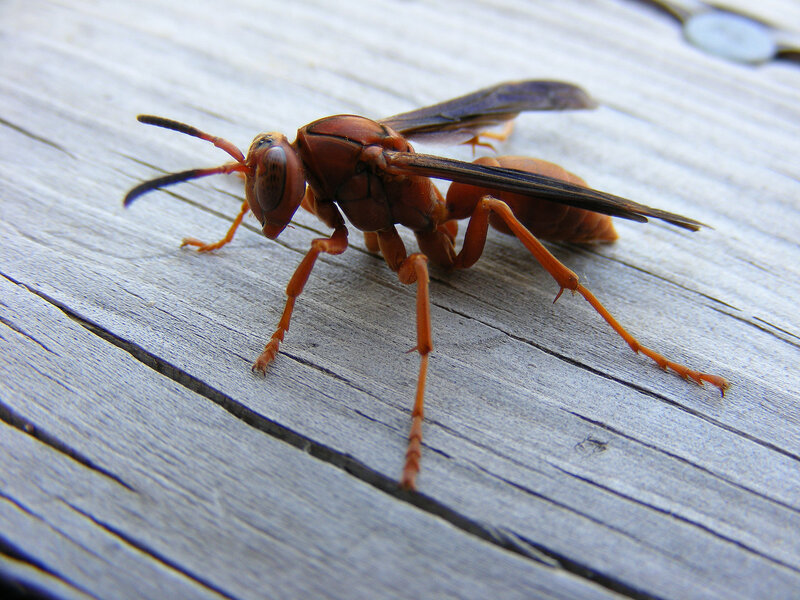 When I saw that I had a red wasp in my hand and it had already stung me, I threw it on the floor and stomped it! (It had gotten caught in my hair and I’ll admit it kind of freaked me out a bit!) I then flushed that still wiggling wasp down the toilet, where it belonged! TMI, yeah. As soon as I took my focus off the wasp, I immediately began experiencing pain. I had gotten stung at the top of my arm but then the pain started shooting across my shoulder blade and down my arm, spreading out from the wound site. I can’t tell you how mad that made me! I began rebuking the pain and telling the venom that it had no right to move through my body like that. It had to stop right now in Jesus name. I wasn’t going to stand for it! I looked in the mirror at the sting sight and it was already swelling up a great deal. I laid my hand over it and prayed again; rebuking pain and swelling. After that, I went outside and told Paul about the wasp and what had happened. When we looked at the sting site again, the swelling had stopped increasing and was actually in a reversal. Paul prayed something about the histamines and the pain lessened even more. That was good enough for me. I considered it a done deal. We cleaned up all our gardening mess, put away our tools and went back inside. When I got in the shower a few minutes later, there was a little pain but the area around the site was still red, but the swelling was completely gone. By the time I got out, even the redness was gone and there was no pain whatsoever. The only sign that the sting had been there was the little red dot where the puncture happened. I’ve never had a wasp sting dissolve and go away like that before. It has always taken at least a day if not two to heal. One thing I can tell you; Prayer works! I know I was divinely healed and when we stand in our authority and pray and declare from that place, miracles happen…..THIS miracle happened! Today I’m pain free and can hardly find where I got stung. Remember, this is normal, everyday life folks. This is the inheritance we get to walk in today. Invite God into your life and expect Him to show up, because He will. Author Ginny WilcoxPosted on May 13, 2015 Categories ConversationsTags Authority, Faith, God, Healing, MIracles, Power, Prayer5 Comments on A day in the life. . . .